When water starts to leak through your basement walls or floors, it can quickly lead to a very serious flood in your home. At MidAmerica Basement Systems, we provide a variety of repair products and techniques -- each designed specifically to take on a different source of leaks in their foundation walls and basement's concrete floors. To get a free estimate on crack repair services, call us at 1-844-218-0509 or click below! We serve in Davenport, Peoria, Waterloo, Iowa City and throughout Illinois and Iowa. 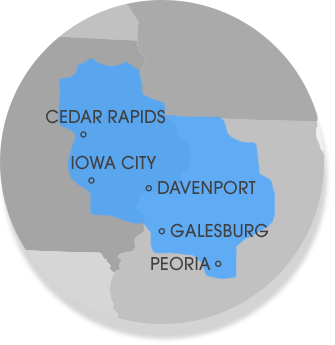 We service Illinois and Iowa, including Cedar Rapids, Peoria, Waterloo, Davenport as well as Dubuque, Iowa City, Normal, Clinton, Moline, East Peoria, Rock Island and nearby areas. Contact us today for a free wall crack repair quote!